Metadata is the language of internet selling and you can’t avoid it. But you also don’t need to be afraid of it. 1. You already know more than you think you do about metadata! You know about your books, authors, trading partners, and readers. 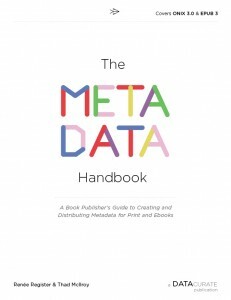 Metadata is the language you use to tell partners and readers about your books and authors. It’s the language of internet selling and you can’t avoid it! So, don’t be afraid of it and build strategies and processes that leverage metadata to your advantage. The “how” is mostly technical — how to format and distribute your metadata. Think about the why, what and who first. They’re essential to your plan and will help you understand the components of how you will communicate. 3. Why do you need metadata? Start by thinking about your desired end results — why metadata is important to your organization. 4. What metadata do you need to capture and share? Consider what information (metadata) you need to support the Whys and that will contribute to desired outcomes. What does my organization need to know for production workflow, marketing, sales tracking, and business intelligence activities? What do my trading partners need to know to effectively market and sell my titles? What do my potential readers need to know? What information will help them find or discover a book and then help persuade them to buy it? 5. Take advantage of BISG’s “Core Metadata Elements” to see what others in the industry consider to be essential in communicating information electronically. These will also help you translate the information you want to capture into individual pieces of metadata that can communicated electronically. Product Metadata Best Practices for Senders, published by the Book Industry Study Group (BISG), includes a list of core elements. 6. Think about who will create it. Who should be involved in internal metadata processes? Who will be receiving and using your metadata? Leverage the knowledge within the organization in creating the best metadata to accurately describe and promote your books. This knowledge is often found in acquisitions, editorial, and marketing rather than in technical divisions. The technical component is about packaging and carrying metadata, not the information itself. 7. Consider who you’ll need to package it, send it, and track it. Veering slightly into the how, do you have the technical expertise in-house or should you consider getting help from a vendor? 8. Make a list of who will receive it. Who are your current trading partners? Are you considering adding distribution or selling partners? You’ll need to know their metadata requirements. 9. If you’re already publishing, start with a review of how you do it now. On to the dreaded “how!” You know what you want to say, who in the organization will help you say it, and who you want to say it to? How do you format, package, and distribute it electronically? How are you pushing information to your own website? How are you letting your selling partners know about your titles? Are you using Excel spreadsheets? An internal system or software that exports data? Is the system proprietary to your organization? Are you using a vendor to assist in metadata formatting or delivery? Are you happy with the effectiveness and efficiency of your current systems and processes? Do your trading partners have difficulty receiving or processing your metadata? Does your staff struggle to get metadata out? Are you satisfied that your current systems and processes are contributing to your desired end result? 10. Find out about industry standards and best practices relating to metadata content, formatting, and distribution and compare them to your current practices. If we think of metadata as the language for electronic communication, using accepted standards and practices helps ensure that the widest number of systems and partners will be able to accept, understand, and interpret your message. The Book Industry Study Group (BISG) offers lots of free information on their website. Here are two examples of important standards. ONIX for Books is the international standard for representing and communicating book information electronically. Using ONIX facilitates communication with the largest number of national and international supply chain partners. ISBN is the standard identifier for books, used and understood internationally for bookselling. Correct use of ISBNs contributes to effective electronic commerce in any selling environment. 11. Inventory your current software and systems to see if they support what you want to communicate and can distribute it a way that’s consistent with industry standards and best practices. How do you capture and store title information? Are you able to capture and store all the pieces of information you identified as important to your organization and your partners? Can you format and distribute metadata in ONIX? Are you able to receive information back from your trading partners? 12. Adapt what you have or select and implement software, systems, and workflows that support the why, who, what and how. Now you have to make some decisions about how you’ll execute your plan. Can you adapt your current metadata systems to implement your plan? Do you need to re-consider staff roles and workflow to streamline the metadata process and take advantage of the knowledge in your organization? Do you need to invest in technology that does what you need it to do? Or, does it make more sense to select a vendor to help you transform your data to meet standards and help you distribute it? 13. Remember you’re not alone! Don’t try to reinvent the wheel through costly trial and error. Most of the knowledge needed to create powerful metadata already exists within your organization. To help fill in the gaps, communicate with other publishers, publishing organizations, and your partners. And, take full advantage of the industry experience documented in best practices documents and other industry resources for the rest. Using industry guidelines, along with your analysis of the why, what, and who of metadata, will help you identify the tools, staff, and vendors you need for the technical component. 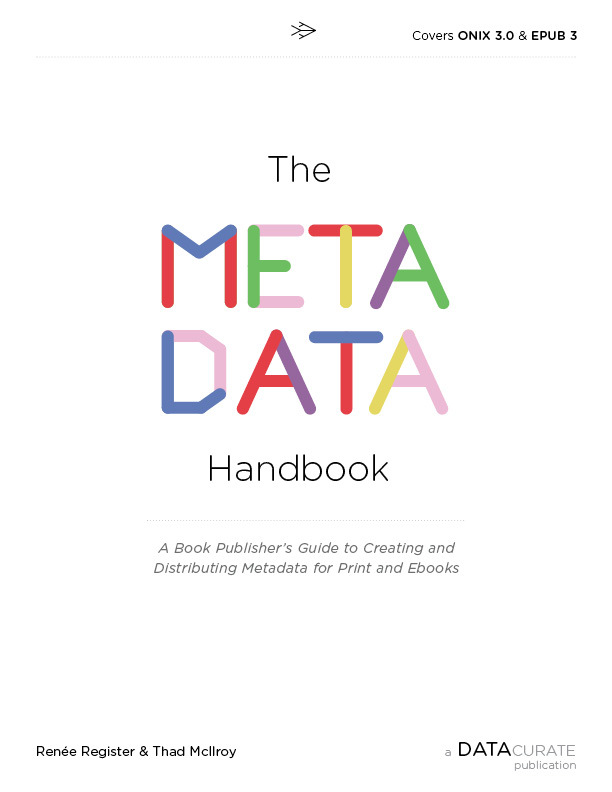 For more information about metadata, read The Metadata Handbook, available in paperback, PDF, and ebook formats, and attend the February 12, 2013 Tools of Change Workshop, Creating Powerful Metadata.